Ken Oyadomari was born and raised on the east side of the Big Island and graduated from Hilo High School in 2008. While growing up, he developed a keen interest in science and engineering from participating in robotics and science fairs. 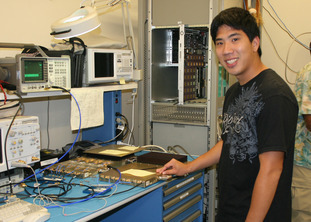 Ken is now a junior pursuing a bachelor’s degree in Electrical Engineering at the University of Hawai‘i at M?noa. In his free time, his hobbies include body boarding, hiking, skateboarding, and tennis. Failed circuit boards are a common problem for any complex electrical system, such as the Correlator Second Down-Converter (C2DC) of the Smithsonian Submillimeter Array (SMA). Off-the-shelf replacements are usually unavailable for these custom systems, so maintaining current hardware is a top priority for its engineers. The SMA is designed to collect astronomical microwave emission at frequencies above 200 GHz, in the submillimeter range. Given current technology, local oscillators cannot produce signals at these frequencies that are also stable enough to be used in the heterodyne process. Therefore, to use the astronomical signal it must be down-converted in a three-tier process from 200 GHz to 153 MHz. The C2DC is the last step in this down-conversion system, converting the signal from 1 GHz to 153 MHz. The down-conversion process in itself is not difficult; the complexity of the C2DC assembly comes from its variety of other functions. The C2DC is made up of five individual circuit boards: the IF Distributer, Down-Converter, Baseband, Digital Analog Converter, Sampler, and Sampler Driver Boards. These boards normalize the signal by attenuating or amplifying its voltage, shift the phase of the signal to compensate for timing differences between antennas, and convert the signal from analog into a two-bit digital signal. Given its multi-functionality, problems with these assemblies vary widely. For this project, I am developing a systematic process to identify, test, and repair these boards. The results will be compiled into a troubleshooting manual, which will be used by future engineers to more easily repair the C2DC boards and extend the life of the SMA correlator system.